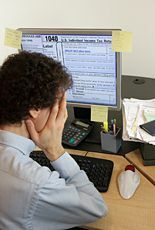 Your tax return doesn't have to be a headache! Over the past year or so, changes in legislation have accounted for over 1,500 pages of new information. You can't be expected to stay up to date with every tax amendment, every new tax break, every change of rule. So let us do the worrying. We keep it simple - just let us have	your information and documents (we will provide a useful checklist), and leave the rest to us. We will ensure that your tax return reflects the credits and deductions you are entitled to, for the best refund possible. If you can't wait for your tax refund to come from the IRS in the normal timeframe, we can suggest various ways of speeding this up, including our QuickChecks service. For more information, please go to the refunds page. 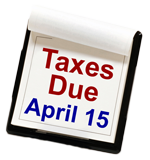 Have you left it too late to meet the regular April 15 deadline for your tax return? No worry - we can submit an extension request to the IRS on your behalf, giving us all more time to put everything together and make sure it is correct. Do you have past years' returns to complete, or do you believe that your previous returns may be wrong? Again, no problem. We can bring you up to date with the IRS and the State by completing past due returns for prior years. We also offer a full review service of previous returns for up to the last three tax years (the maximum allowed by the IRS), and can amend and re-submit past years if our review suggests it will be worth doing. This means that during 2013, we can review your returns for 2010 through 2012, as long as amended tax returns are submitted to the IRS by April 15. Unlike with many other tax preparation firms, this is a free review if we are also preparing your current tax return. Friendly and professional tax advice is always on hand, whether it is as part of completing your regular tax return, or on a separate consultancy basis to discuss your changing needs or a once-only event that needs careful handling for tax purposes.